If you're considering or already working in a career in law enforcement or corrections, you are probably wondering whether or not you should join a police union. To make a good decision, you'll need to understand what police unions are, why they exist and what they can do for officers. Once you're armed with the facts, you can decide whether it's worth your while (or your money) to become a member of a union. Labor unions in the United States have their roots in the trade unions that developed in colonial North America in the mid 18th century. Hoping for better wages and working conditions, craftsmen and tradesmen banded together as unified voices within their communities to move towards improving their work and their workplaces. Through the years as economies and technologies reshaped the kind of work performed in the U.S., the trade unions influenced the development of labor unions. The labor and trade unions soon found a common interest and merged, eventually becoming parts of an overall international labor movement with the stated goal of making work better, safer and more lucrative for members. The unions' main focuses were on workplace safety, wages, and working hours. As law enforcement as we know it evolved in the United States and beyond, police officers found themselves working long hours, often 6 and seven days a week, and facing threats and dangers other occupations simply didn't. 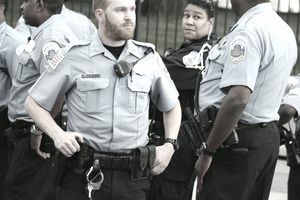 The nature of officers' jobs presented unique challenges that made the need for unions that could address law enforcement-specific labor issues apparent. For example, whereas factory workers might be able to stop work or strike to fight for improvements, laws prevent officers from doing the same. Their unions were needed to find other ways to help make working conditions better for officers by establishing criteria for overtime pay, callouts, and officer discipline. Police unions work with law enforcement leaders and rank-and-file members to negotiate better pay and protect the rights of officers. Unions were instrumental in introducing and implementing job protections like the Police Officers Bill of Rights around the U.S. Besides championing better wages and working hours, though, police unions have significantly influenced how and when officers can be disciplined. They've also established systems of due process for officers to have their discipline reviewed, which has, in turn, helped protect rank and file police officers from false accusations and potential political abuses. Police unions offer some specific benefits to their member officers. Those benefits often include life insurance, disability benefits, and counseling services. They also notably include legal representation for situations that may arise on the job. That legal representation can prove indispensable if you ever find yourself in trouble or under investigation by internal affairs. In a perfect world, there would be no need for unions. Everyone would be paid well, discipline would be administered rarely but fairly, and no one would dream of falsely accusing an officer of wrongdoing. Obviously (and unfortunately) this is not a perfect world. If you are going to work in law enforcement, the fact is that you can very easily find yourself in a situation where you'll want the benefits that a police union can offer. If you can afford the usually relatively small cost of union dues, it's probably a good idea to join one.